As of April 5, 2019, TAHIT announces the launch of a new membership portal! We have made some great upgrades by partnering with Member Planet to manage our membership. 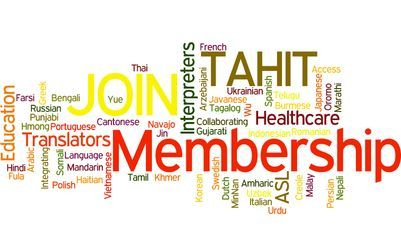 In addition to that, we have made an effort to be more inclusive of interpreters and translators who work for agencies and LSPs, by providing those organizations with two new membership levels to ensure that their language professionals have the same opportunities and ties to the Language Access community. (See below: Organization-level and Corporate-level Membership.) In addition to the two new levels of membership, some of the benefits offered in the new members-only area include networking tools, member searches, job postings, a discussion board, and a new document storage area where we can post resources and presentations from our events and webinars. Membership has never been more affordable or more valuable! Individual Memberships are the backbone of TAHIT. These memberships are intended for individuals who are stakeholders in providing language access for LEPs and the Deaf and Hard-of-Hearing. Whether a provider, clinical staff, an administrator, a language professional, or just an ordinary person who cares about doing what is right, this is the best choice for most individuals. Department Memberships are for small groups of up to five (5) individuals. This option allows the 5 selected individuals within your deparment to become members and be eligible for member discounts on events, merchandise, and webinars. These movers and shakers on your team can keep a larger group in the loop with everythign happening with TAHIT and in the industry. Organization Memberships are for medium-sized teams and allow an organization to provide membership for up to 25 individuals. This is a 50% savings off the cost of an individual membership and these individuals will also be eligible for members-only discounts on TAHIT-sponsored events and webinars. Make your whole team feel included in the industry! Corporate Memberships are for large agencies and businesses with hundreds of Language Access Professionals. You can provide an incredible access to the interpreting and translating professions to your staff, management, or contractors. There is no better way to create an impact on connecting people and ideas in the industry! Student Memberships are for--well, students! It's expensive being a student, and TAHIT wants to lend a hand. If you join as a student with your ".edu" email account, you are eligible for this student membership that costs a fraction of an individual membership. You may have to survive on ramen, but you can also be connected to the profession. Join today!